Someone in the house has been diagnosed with the flu. This places others in the household, especially close contacts (those within six feet of the sick person), at risk for developing an influenza infection as well. While providing basic care, home caregivers of a person with the flu can protect themselves and others from unnecessary exposure to the influenza virus, may benefit from anti-viral prophylactic treatment, and can use sanitary practices that may lessen the spread of flu germs. Are People in the Household High Risk for Flu Complications? People who are high risk for complications of the flu should contact their healthcare provider regarding whether or not to obtain anti-viral treatment if they are in close contact with someone diagnosed with the flu. If possible, people who are at high risk for complications from the flu should avoid exposure to people who have flu-like symptoms. If the primary caregiver in the home is in a high-risk category, ideally another caregiver should be designated to care for the person with flu symptoms. If another caregiver is not an option, try to limit exposure as much as possible. Many people who are in high-risk categories are encouraged to get the flu shot, and people in their household may also be encouraged to get the influenza vaccine whether or not the high-risk person is eligible for the shot, but the vaccine will not help someone who has already developed flu-like symptoms. People who get the seasonal influenza shot and/or the H1N1 (swine) flu shot can still get the flu. Others in the home may contact their healthcare provider or a flu hotline to see if they should obtain a prescription for anti-viral medications, whether or not they are in a high risk category for flu complications. If others in the home begin to have flu-like symptoms, they should contact a healthcare provider or flu hotline. Avoid close contact with the sick person by having that person stay in a separate room with a separate bathroom, if possible. Encourage visitors to call rather than to visit in person. Have the ill person or others in the same room wear face masks. Designate one person, preferably someone that is not high risk for complications, to care for the sick person. Avoid having a sick person to care for those who are high risk for complications of the flu, such as infants or elderly members of the household. Have all persons in the household cover their coughs or sneezes with their inner arm. People who are carrying small children who are coughing and/or sneezing may protect themselves by carrying the child with his chin on the caregiver’s shoulder. Wash hands appropriately and frequently. For more information on handwashing, see the article entitled Washing Hands Saves Lives. Consider using paper towels rather than cloth towels during the infectious phase. Ensure that all disposable items, such as tissues, used by the infected person are put in the trash after use. Keep surfaces and other items in the home as clean as possible by disinfecting them per manufacturer’s recommendations. Common eating utensils should be washed before another person uses them. Dirty linens should be handled carefully and washed with laundry detergent and dried on a hot setting. Readers may wish to read How to Make a Bed With Someone in It. 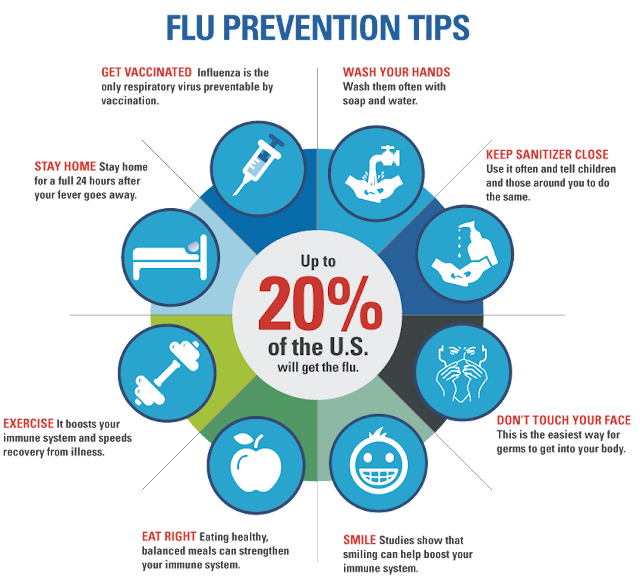 When someone in a household is diagnosed with the flu, others are at risk for developing influenza as well. Other contacts within the home, especially those at risk for serious complications of the flu, can use these guidelines to help protect themselves and others from getting the flu as well. No preventive measures will guarantee that others will not get the flu, but these guidelines may help lessen the flu symptoms of close contacts if they do get the viral infection as well. Although the source listed below is geared toward H1N1 or swine flu, many of the suggestions above can help if someone in the household has seasonal flu as well.